LOUDON, N.H. – For years, people expected Dale Earnhardt Jr. to emulate his famous father and race for NASCAR championships. And year after year, there has been nothing but disappointment for Junior and his legion of fans. Now in his 13th full season in the elite Sprint Cup series, the 37-year-old Earnhardt has what appears to be his best chance yet to win his first Cup title. Going into Sunday’s Sylvania 300 at New Hampshire Motor Speedway, Junior is seventh among the 12 eligible drivers after finishing eight last week at Chicagoland Speedway, the first of the 10 races in the Chase for the championship. But there is still plenty of time for Earnhardt to overcome the 17-point lead by Brad Keselowski. The big plus for Earnhardt and his No. 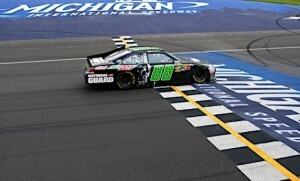 88 Chevrolet team this year has been and remains consistency. In 27 races, a very determined Earnhardt has only one win, but he has registered 10 top fives, 18 top 10s and has finished worse than 15th only four times. In a recent Sports Illustrated story, Earnhardt admitted that at times he may not have taken his racing as seriously as he needed to. Friday at the Loudon track, he said that attitude has changed. “I would say, if I had known then what I know now, that I could put forth a better accountability and a better account of myself overall as a competitor,’’ he said. “At the time, you don’t realize what kind of opportunity you have got. … There’s a lot of trappings and things that you want to do that don’t involve racing. Just go have fun. So, you goof off a lot. “I can’t really sit here and have regrets about opportunities and chances gone by. I do find it a bit unfortunate that it took me this long to realize how much work I could have been doing and how much more I could have invested in the overall schedule of events and just what you do on a weekend. “We had a lot of fun back then, and we didn’t have as much success as we probably should have,’’ Earnhardt added. Junior said one big difference is that he now enjoys working hard. One thing that has definitely changed for the better is his physical condition. Earnhardt said he watches his diet much closer than in the past and tries to work out more. Earlier this week, there were big changes at JR Motorsports, with the team dismissing Tony Eury Sr. and Tony Eury Jr., Earnhardt’s uncle and cousin. Junior, a co-owner of the primarily Nationwide-series team, was asked how he is dealing with that situation while attempting to focus on winning a Cup title? “It doesn’t really weigh on me when I go to work,’’ he said. 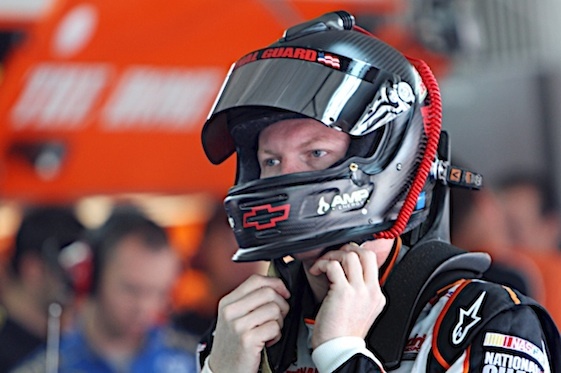 “It’s something that I can easily put aside when I’m at the race track this weekend. Earnhardt, who drives for Hendrick Motorsports in Cup, said he and his sister, Kelley, another co-owner who oversees JR Motorsports, believe they have to maximize the relationship with Hendrick for the team to move forward. They hired NASCAR veteran Ryan Pemberton as the team’s competition director, a role similar to what Eury Sr. had, and as interim crew chief for Danica Patrick, replacing Eury Jr.
Earnhardt pointed to Pemberton’s relationship with Steve Letarte, his Cup crew chief, and with team owner Rick Hendrick as important reasons for the changes. He said the decision has been made to run two cars full-time in Nationwide next season and that he will run three-to-five races in the second-tier series. But, this weekend, Earnhardt’s total focus is on Cup and winning a race at a track where he has never quite made it to Victory Circle. “It’s just a little bit frustrating that I haven’t won here because I feel like it’s a track that I should be capable of of doing that,’’ he said. “I’ve had some good cars here and I really like running here. I like short-track racing, and the corners and the speeds here kind of lend itself to that style.